Professional Maintenance Can Go A Long Way! While incredibly handy, your garage door can become a pretty dangerous device if you do not have experts like ours to perform safety checks and carry out maintenance from time to time. There a number of common issues that reappear when it comes to these systems - however with a little bit of maintenance and lubrication, you can keep hazards at bay and keep your unit healthy for longer. Modern garage door openers are equipped with a safety reverse feature that should cause the door to open if it hits something in its path during closing. If the safety reverse feature on your door malfunctions, the door will not know to rise back up and has the power to crush anything in its path. Don't ever let it get to this, our teams can check this feature, ensure that it is working properly and catch any issues before they snowball into larger ones. It's surprising how much a bit of lubrication can make a difference. During our preventative maintenance, we will lubricate any parts that need it including the springs and rollers (unless nylon-coated). Over time, rust can seriously hamper the performance of your system and trigger larger, more costly, issues to fix. Significant rust also clearly ruins the aesthetic of your garage door. These are just some of the reasons that explain why we think prevention is always best! During a regular maintenance visit, we will safety test your springs and confirm they're not compromised. If they are stretched out or worn down, they may not have the strength to safely and slowly lower and raise the door. 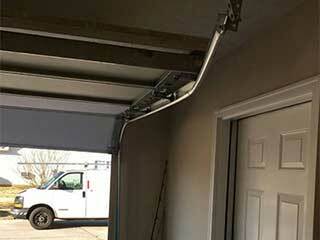 A snapped spring can also cause a garage door to drop quickly, injuring anyone or damaging anything in its path. Our experts at Garage Door Repair Palatine are qualified to perform necessary safety and perform all necessary maintenance on your garage system - call us today to book your appointment.